In his 1959 essay “La parole quotidienne,” Maurice Blanchot effectively describes the common experience of existence—that fact of being and living through one’s own everyday agenda, one’s own distinct condition, however relatively ordinary it may seem with respect to any other’s—as essentially always active in light of its fundamental indeterminacy. To participate with and experience the world, as we automatically and necessarily do as long as we are living, is to operate in an often undramatic yet nonetheless mobile progression through the present, towards something unstable and energized; the present—that tugging war that wavers between our recollection of the past and our anticipation of possible futures—is never a static thing. It’s always becoming something new. And yet those quotidian details that define the majority of our experience of reality are also the ones traditionally deemed the least worthy of narration, especially in cinema, because, as we are conditioned to enjoy it, it’s a medium in which significant things happen, one after another, according to a discernible logic that ultimately means something. After further complicating this conundrum with an additional set of cutaways—first taking us back to the writer (who is now no longer typing but instead changing her shirt), then returning to the woman in bed—the voiceover drops out and gives way to a new audio track. This one, which is seemingly diegetic (at least, we now hear room tone), features the voice of a man (offscreen) who is discussing a painting acquisition with another man (also offscreen). At the end of their conversation, one of them walks into the room where the woman lies in bed (though he remains offscreen) and begins a dialogue with her, wherein she asks him what’s on the painting—that is, asks him for an image that might animate or excite her interest into his business—only for him to deny her request, teasingly replying, “Oil paint.” The man leaves while the other stays, and the woman, who we learn is named Maria, announces a scheme, perhaps jokingly but perhaps not, to steal the painting that they were just discussing. Thus, in the span of five minutes, Schanelec introduces us to no less than three possible narrative trajectories that her film might follow, all of them proposed by words and ideas spoken by people whose faces we either haven’t seen or can’t be sure of, and all working to release us and the characters from the anti-dramatic stasis depicted on the screen: a woman sitting and typing words; a woman lying in bed; and a woman changing her shirt. Two of these narratives will play out, but the details are so impressionistically presented that the import of their structures is entirely diminished. Cars drive, dreams are recounted, couples glance and dine, but the essence of our experience is located not in concerns over what might happen next and how that will be shaped by our memory of what’s already been shown, but rather in observations that are more elemental: noticing who is in the company of whom, the fluctuating degrees of pleasure and (dis)satisfaction these individuals exude as a product of that company, or, most significantly, the frustrations we might have felt when we heard something we could not see, or saw something we could not articulate. Lest we suspect otherwise, this modus operandi is confirmed as intentional in the movie’s self-reflexive final scene, where its two narratives don’t so much as converge as unexpectedly and somewhat surreally combine agents. The writer, Nadine (Schanelec), and Maria’s boyfriend, Louis (Tobias Lenel), meet at a cafe to discuss Nadine’s short story (presumably the one we heard at the start of the film). His observations and criticisms are meant to imitate what many (especially the detractors) would probably make toward the film itself: it’s short, is over before one can engage with the characters, lacks clarity, and one can only get a sense of its purpose as opposed to fully experiencing it. (He also, amusingly, thinks it lacks editing, no doubt nodding to the film’s reliance on long takes.) Nadine’s response to his remarks is instructive: she would rather her work evoke memories, and compares her aims to how one might hear and love a piece of music, fondly remembering the context in which she heard it and the feelings it evoked, despite perhaps having forgotten the lyrics or its overall shape. It’s apparent, then, that I Stayed in Berlin was meant to function as an artist’s statement in addition to being an autonomous dramatic piece in its own right, and it’s a testament to Schanelec’s commitment to the explicit and implicit philosophies it presents us that we can still, more than 20 years later, read—or rather, feel—her films in these terms. In the decade-plus since she graduated from the dffb—a period during which she would complete five significant, under-travelled features: My Sister’s Good Fortune (1995), Places in Cities (1998), Passing Summer (2001), Marseille (2004), and Afternoon (2007)—Schanelec continued to assert, refine, and experiment with the mechanisms by which she could show stories without actually telling them, and has thus been faithful to the idea that literal communication is irreparably deficient. These are films in which social transactions of virtually any kind are not only insufficient for forging or maintaining connections, but can be toxic to those means as well. Instead of words, precisely framed actions achieve a greater currency. Bressonisms have been evident in Schanelec’s work from the beginning, but, starting with Places in Cities, his hand begins to feel more conspicuous—as a formal influence, yes, but perhaps even more so as a tool in her toolbox, or a word in her vocabulary. This is most clearly acknowledged when Places’ protagonist, Mimmi (Sophie Aigner), expresses her love to a boy, Nicolas (Jérôme Robart), with whom she’s just met and had a one-night stand (depicted so glancingly you’d be forgiven for not realizing it even occurred), by substituting the morning after’s sweet nothings for a summary of Dostoyevsky’s White Nights, a novel that was adapted, of course, by Bresson for Quatre nuits d’un rêveur (1971)—a film that lends Places both its moon-kissed aesthetic and its painfully disillusioned romanticism. But more than a feeling, Schanelec and Bresson share a belief in the opacity of their actors’ interior worlds as an essential component of their procedures. Figures in the frame, devoid of a discernible awareness of intention or conflict, are always complicated by their anti-hierarchical positioning with respect to any other sign or gesture. These films project almost nothing, making it our obligation, as spectators and as subjects, to see into and through them, to (not) psychologize the image, so that every thought and emotion contained therein can find its way back to us. Bresson enabled this with his singular brand of shot reverse shot editing, emphasizing oblique angles and the cut to signify the act of seeing that we participate in; Schanelec only further distances the viewer by doing away with shot reverse shot editing almost entirely. The long take reigns supreme, every cut revealing to us a new image, something or some angle that we have not yet seen, and time becomes essential to our efforts to grasp any given shot’s spatial dynamics. Favouring tight, closed-in compositions, Schanelec’s framing lets figures slip into and out of the composition, their glances often obscured either by silhouette or precise blocking, strengthening our faith in sonic information, including, once again, language and communication. This account needs to also make room, though, for the other signature motif of her narratives: their thematic and structural bifurcations. These forks and parallelisms productively and often imperceptibly work to divide our attention between two places, two characters or sets of characters, or two temporal realities (one of which tends to be illusory, imagined, or dreamed), and they, along with her arrival on the scene in the mid-’90s, have consequently given critics an avenue to interpreting Schanelec’s work as a response or subtle polemic against Germany’s reunification. That is, that her films embody dualities and broken relations between loving individuals as a kind of allegorical expression of the country’s re-conjoined psychology—still fractured from the trauma of that initial severing, and now reeling to reassert some semblance of liberation amidst the looming spectre of neoliberalism. But this mode of reading Schanelec’s work tends to feel specious, likely because the narrative material is so sparse that any effort to ascribe this or that as symbolic of something or other will necessarily be taking great, usually far-fetched leaps. Instead, the coupling of elements in her films seems purposefully designed to provoke comparison, i.e., interpretation, as another device for dissatisfying our desires for a deeper understanding of our experiences—for placing ourselves in a closed, logical system of meaning. Take Marseille, in which a German woman, Sophie (Schanelec regular Maren Eggert), swaps flats with a woman in the southern French port town for reasons we’ll never know, photographs the city, acquires a car, and befriends a charming mechanic (Alexis Loret). For the first two reels, it’s the most conventional plot Schanelec has drafted by a mile, complete with a central, clearly lensed protagonist, personality traits that seem designed to earn our sympathies (and, for the most part, they do), and even manifest desires and hopes. It’s a narrative that generates anticipation in us, for her, and thus has us looking beyond the present. Then, as if waking from a daze, Marseille snaps and breaks. We find ourselves dropped somewhere in Berlin, Sophie now backgrounded, and a new, married woman named Hanna (Marie-Lou Sellem), a theatre actress, emerges as an object for our contemplation. Hanna’s husband, Ivan (Devid Striesow), works as a photographer, bringing us back to Sophie, along with vague intimations of a possible extramarital affair. No matter, we’re now treated to distended rehearsals of a stage play with a spare, neo-Victorian mise en scène, fashion shoots at a washing-machine factory, and, finally, Sophie, back in Marseille, in a police station recounting a reported mugging for investigators. Ripped from the narrative’s initial account of a burgeoning relationship and tossed into a wilderness of activity we have no handle on (coincidentally, Marseille screened in Cannes the same year as Tropical Malady), the present reasserts itself, and the primacy of interpretative thought in the face of the unknown is, again, affirmed. Consequently, details that earlier seemed innocuous become loaded and potentially significant. Marseille, a city of immigrants, traces of Mediterranean noir bubbling to the surface, strangers becoming Others and femmes now potentially fatal. Pursuing happiness is dangerous, and who, really, was in that car on the highway? Playing along, Schanelec’s conclusion to this now-mystery invents a crime, which we never see and may have never taken place at all, and hinges the fate of a woman who we’ve nearly forgotten—the film’s protagonist, Sophie—on an increasingly critical Q&A session with offscreen interrogators. First speaking to them in German through a translator, Sophie finally switches to French (not her native tongue) and becomes more lucid, yet her words more abstract. 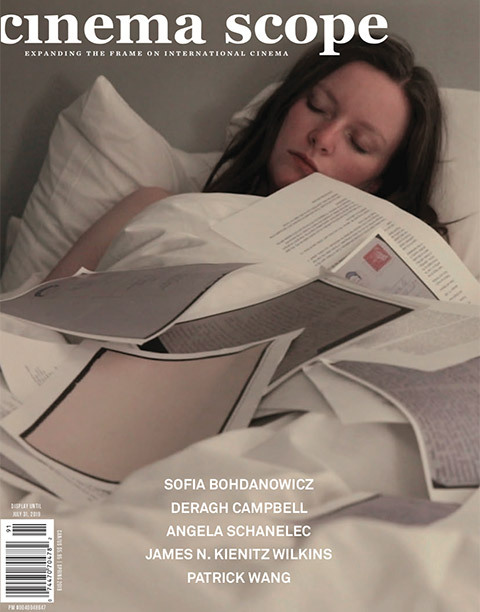 Finally, out of nowhere, she says “I want to listen to music”—the film’s final line before an endless silence, and a reprise of Schanelec’s philosophy of cinema logic that states that emotion itself can rescue Sophie from the burden of memory (of recollection) and liberate us from drowning the film in our arbitrary explications. Instead, we drown with Sophie in a sea of her own tears, flowing for minutes before she is released back into the world, after which she ends the movie by walking—ominously, defeated, and exuding some notion of dignity—toward the ocean. Two films later, Schanelec’s Orly (2010)—a film that seems to have been taken up as the consensus pick for her weakest effort—feels more like a schematic exercise than a major work. Eavesdropping on an Altman-esque assortment of disparate players, the structure hops around its transitory non-place (an Orly terminal) to compose a breakfast sampler of undeveloped narrative excerpts that we know from the outset will be presented as fragments. A minor misstep—though at least it’s instructive, a kind of state-of-the-union address that reminds us how we’re meant to watch her movies—it was followed by a six-year hiatus (prompted by difficulties achieving funding for her next project), the longest gap in her career, setting the stage for her long overdue return with The Dreamed Path, perhaps the freshest and most profoundly emotional film that she’s ever made. In a crisp, 4:3-framed digital presentation, and featuring line deliveries and behaviours more affectless (or, if you’d rather, more “Bressonian”) than usual, Schanelec not only stays true to the aesthetic and philosophical tactics that made up the foundation of her work, but ups the ante on them in nearly every sense. True to its title, The Dreamed Path conflates reality with dream states, past with present (or is it present with future? ), and desire with existential dread, all producing an amorphous, exceedingly enigmatic trance film masquerading as a puzzle film. Puzzles fit together; this does not. The tradition of depicting dream logic in art-minded filmmaking inevitably leads one back to the Surrealists—Dulac, Clair, Dalí, Buñuel, et al.—and it’s useful to relate the philosophies of that movement to those found in Schanelec. In his quest to gain access to his unconscious, André Breton and other heads of the movement found the eventual resolution of dreams and reality to be the formation of an ideal, “absolute” reality, which he attempted to access by “automatically” scribbling down, in words but also images, those ideas and archetypes burrowed deep within us that the conscious, thinking mind obscures. Similarly, they turned to dreams, hallucinations, and other altered states where the subconscious ascended above cognition—beyond thought, beyond culture—where they believed they could glimpse some real, perhaps insane, but nevertheless more Truth-ful and affective form of information. To achieve this in film, they broke away from material reality, but usually by juxtaposing and superimposing traces from the world, rather than distorting or abstracting it. Even when the Surrealists deployed shock tactics (via cuts to uncannily related images), they did so by heightening our perception of quotidian details, not by resorting to fantasy or some other immaterial fiction. If we follow this route, experiencing and understanding The Dreamed Path becomes a far less daunting task than it may seem on its surface, precisely because meaning can be—perhaps ought to be—all but negated in favour of tuning in to its affective logic. In the film, we’re introduced to two vagabonds, a couple (Thorbjörn Björnsson and Miriam Jakob), who makes ends meet by covering doo-wop oldies like “The Lion Sleeps Tonight” in a parking lot, while overhead a banner promoting Greece’s forthcoming accession into the EU flaps and flutters on a windy day—a detail that places us somewhere around 1981. Later, after Björnsson’s character returns home to be with his fatally injured mother (who’s suffered “an accident”), another temporal marker emerges: a news broadcast showing footage of fleeing East German refugees scrambling to the West, signalling that we’re participating in an allegorical mode of thought that, once again, concerns structural bifurcation and reunion. The next time we see a temporal marker, Jakob is receiving a letter summoning her to Berlin for a traineeship at the French School in August 1989; the deliberately sustained mystery of where we are in history is lifted, and Germany’s reunification is reasserted as a key agent in the film’s network of meaning-creating signifiers. This stability is again almost immediately disrupted when, moments later, accompanied by her young son, Jakob lies down in a wooded path to close her eyes for a rest, and the film resets to focus on a new, as-yet-unseen cluster of characters. More minutes go by, and Schanelec finally unveils our new temporal placement in the present—i.e., approximately 2015—by casually showing a modern taxi cab parked behind a passing Berlin tram. However invisible they are, these temporal leaps we’re taken through (which may number anywhere from one to four by the movie’s halfway point, and which in some way resemble the absurdist ellipses of Un chien andalou , albeit without the courtesy of intertitles) are foregrounded in our cognitive engagement with the goings-on, and, in a typically non-hierarchical and democratic fashion, become equal to every other narrative element—from a man’s devastation after the loss of his mother and his displacement from his girlfriend, to a woman’s awaited return to Berlin after who knows how many years away. 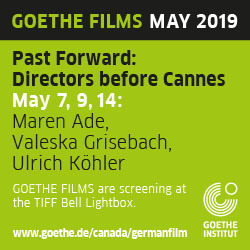 Time, then, beyond language, becomes the decisive medium that negotiates and complicates characters’ emotional relations to one another, and Schanelec’s avoidance of distinguishing between “now” and “then” insures that the impact of every loss, every ruptured relationship, is held in an eternal suspension. The sensations of loss and absence don’t disappear; they merely become buried and repressed by the necessary participation in the present, which is at its most valuable when it precludes recollection, allowing us to forget. With The Dreamed Path, then, Schanelec deploys images and striking moments as a form of salvation from tragedy, and she perversely does so while simultaneously levelling them against repeatedly emphasized remnants from a tangible, increasingly painful past. Among the film’s visual ideas intended to distract our consciousness from contemplation: a strand of toilet paper caught in the skirt worn by a fictional police officer (Eggert), slapping furiously in a breeze as she climbs an arid hill during a film shoot; a cast healing the fractured arm of a girl who mostly needs her feet to do what she loves; a young girl endearingly tonguing a disabled boy’s leg wound after he crawls out of a swimming pool; and an improbable re-emergence of a character we’d long since left behind, un-aged and wearing the same clothes, receiving an interpretive dance of physical therapy while a remix of Disclosure’s “You & Me” plays on the soundtrack (perhaps [still] diegetically). And despite this impressionistic turn—this indiscriminate deluge of piercing moments—Schanelec keeps our experience in check, provoking us to occupy a mental space where, yet again, we are inclined to think towards a story, even as our bodies say we can (if not ought to) surrender to its oneiric bliss, and abandon its tides of loss.